Which is better: a biological catalyst like an enzyme or an inorganic catalyst like gold? This is an age-old argument for chemists that generally has no right answer – it all depends on the context of your reaction. Each catalyst has its own advantages and it is sometimes hard to choose one or the other so why not combine them into a powerful hybrid catalyst? That’s exactly what the researchers did in this recent article from ACS Catalysis. A major goal in current research is to combine chemistry and biology into hybrid systems that have stronger capabilities than the individual systems alone. Biological catalysts like enzymes are extremely accurate and efficient with what they can catalyze but are sensitive to heat and other external factors. Inorganic catalysts, on the other hand, are typically not as selective as enzymes but can survive and function in more extreme conditions like high heat and pressure. The researchers here started with a biological framework then asked the question – Is it possible to take a bacterial microcompartment and adorn nanoparticles onto the outside of it? Bacterial microcompartments are composed of proteins that form together into hollow, permeable shapes like the ones shown in Figure 1. These hollow compartments can then house enzymes which perform specific reactions that may be harmful to other parts of the microorganism, thereby isolating reactions and protecting other parts of the cell. 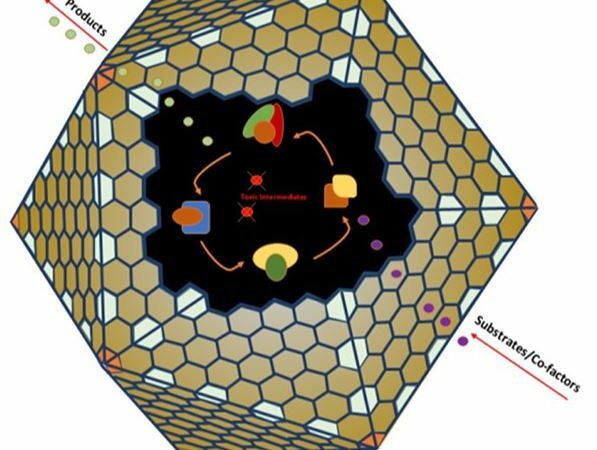 By producing these and adding gold salt to the solution, the researchers were able to form microcompartments adorned with gold nanoparticles on the outside. Figure 1: The hybrid catalyst system can convert 1,2-propanediol into 1-propanol using the enzyme PduCDE (right, middle) while reducing p-nitrophenol to p-aminophenol using a gold nanoparticle catalyst that is attached to the outside of the microcompartment. Gold nanoparticle formation is fairly simple. To begin the reaction, gold salt (auric chloride) is first added to the solution. Then to initiate the nanoparticle reaction, a separate agent is needed to reduce the gold salt Au (3+) to Au (0), which allows the atoms to bond together to form nanoparticles. These reducing agents are typically separate compounds like sodium borohydride, however, in this case the authors cleverly used the protein microcompartment itself to reduce the gold nanoparticles – imagine this like condensation on the side of a cup where water particles keep building up until small drops form on the surface. The researchers then tested whether both catalyst systems can work simultaneously, i.e. the gold nanoparticles catalyze a reaction on the outside of the microcompartment while the enzymes on the inside catalyze other reactions. 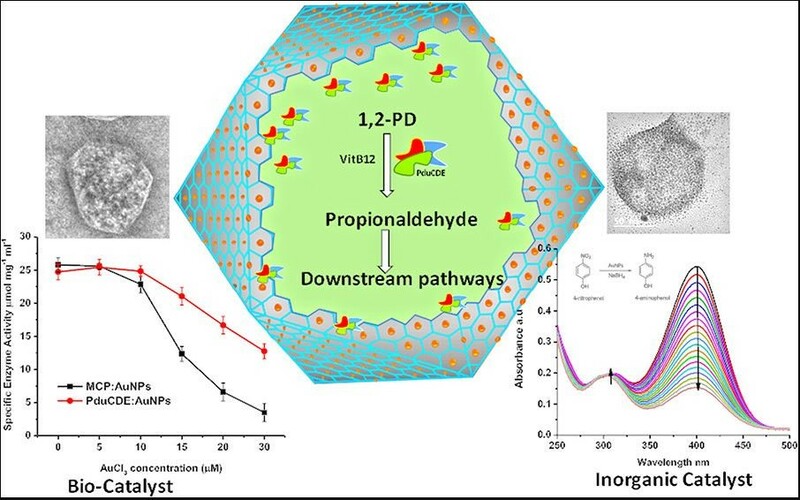 As shown in Figure 1, the researchers successfully showed that the gold nanoparticles can catalyze the reduction of p-nitrophenol to p-aminophenol (bottom right) while the enzyme PduCDE can catalyze three reactions, converting 1,2-propanediol into 1-propanol within the microcompartment (middle). By showing that both catalysts can work simultaneously, the authors present a strong example of parallel reactions. Similar to how parallel computing completely changed the field of electronics, parallel reaction systems could lead to incredible advancements in field of catalysis. The current system is not yet perfect, though. The researchers found that the formation of the gold nanoparticles on the microcompartment blocks transport of chemicals back and forth because the nanoparticle tend to accumulate near the pores of the microcompartment. Through further research and optimization, hybrid parallel reactions may soon become a reality.